In the first of a two-part interview with Dr. Cathy Baase, Global Director of Health Services for Dow Chemical, The Benfield Group's article outlines the key philosophy and approaches Dow has taken over the past 20 years to increase value to Dow by improving employee health. Central to Dow's approach is their map which focuses on employee effectiveness and illness/injury management. 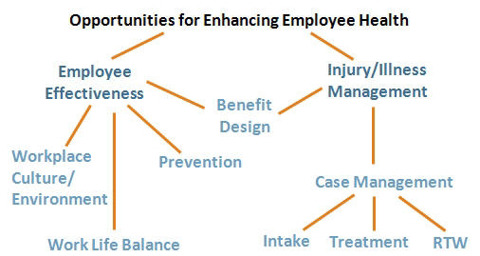 As you can see, the common element between employee effectiveness and illness/injury management is benefit design. 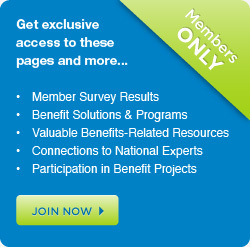 MBGH has been working with our members for the past 3 years to focus on value-based benefit design that motivates and supports employees to stay as healthy as possible for as long as possible and to use high-value healthcare services. In many ways, benefits and benefit design are the strongest levers employers have to impact employee effectiveness and illness/injury management. Dow believes that taking this approach results in improved performance for the entire company. What does your organization's map look like? Do you even have a map that helps you think through and organize your overall approach to employee effectiveness and illness/injury management? Does that map directly link to your organization's overall performance, including financial success? Read The Benfield Group's entire interview with Cathy Baase. Let MBGH know how we can help you map your approach and fill in the blanks!